Girl’s Room Reveal – finally! Can you believe I’m finally calling it finished and sharing it with you?! 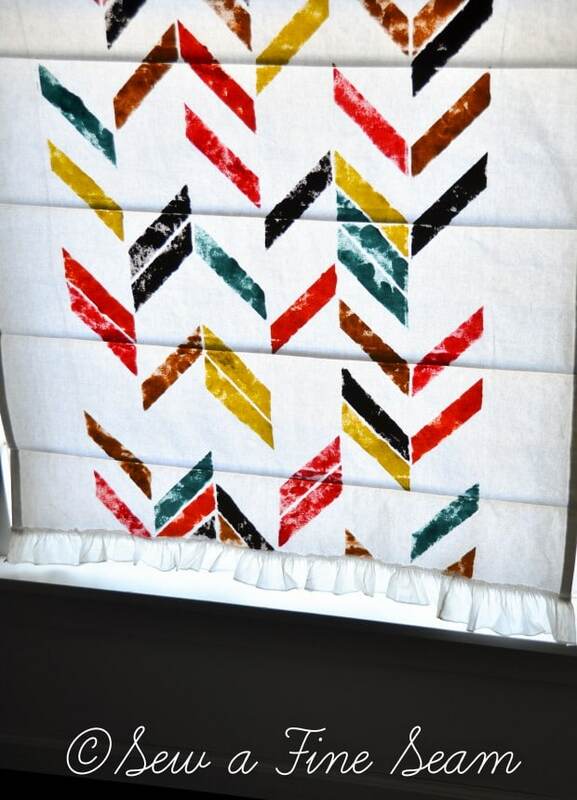 Remember the Roman Shade I made for my girls room? And then I painted their wall using a stencil from Royal Design Studio. The stencil was given to me to do the wall project in return for a blog post from me about it. Once I had the wall done, the Roman shade didn’t go with the wall. 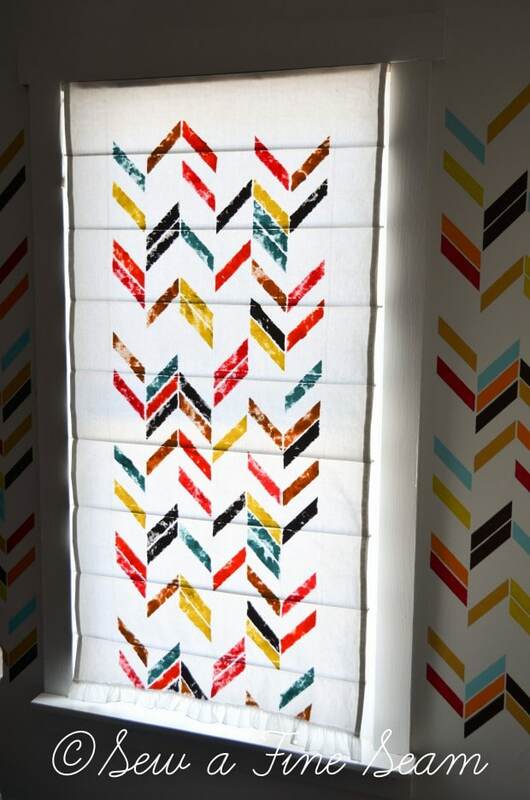 So to bring you a full room reveal I needed to come up with a new window treatment. I used the same paint I used on the wall, same stencil, same foam rollers for my brushes. And now I can finally show you the whole room! I added a vintage ruffle to the bottom of the shade – it is a girls room – but my girls don’t like a lot of girly stuff. So I have to work in a few frills where I can. This ruffle was with a bag of vintage lace I got at a garage sale last year and all I had to do was sew it on. 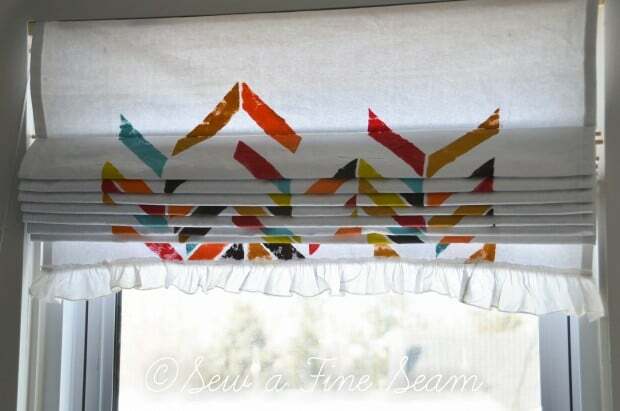 I am loving the look of the ruffle on the rather mod looking stenciled shade. And even better, my girls both loved it too! Score! We also changed out the 10 year old carpet for hardwood. I ordered 3 of the Spot Rugs from JcPenny’s but only 2 of them showed up. It took several weeks to get it straightened out and then they refunded me instead of sending me the rug. And I’ve never got around to reordering the third rug again. 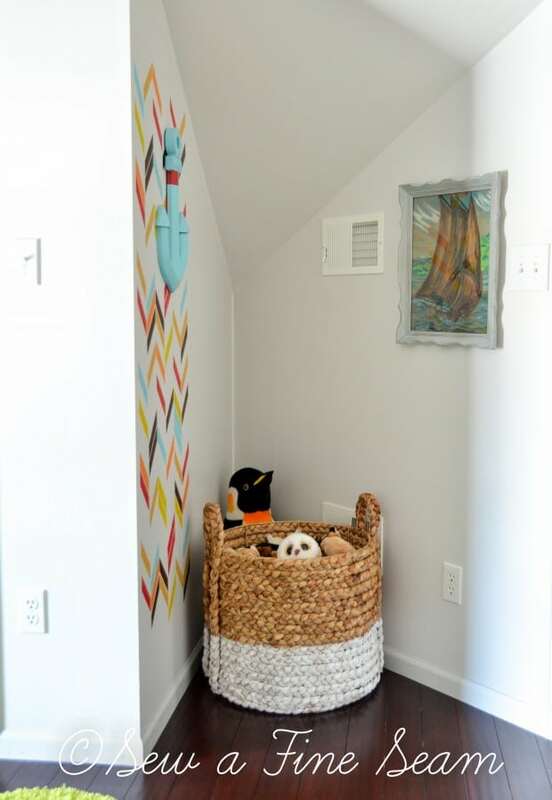 This little nook was created right inside the door when we added the closet to the room. Old houses do not come with closets or any place to store things or keep clothes out-of-sight. 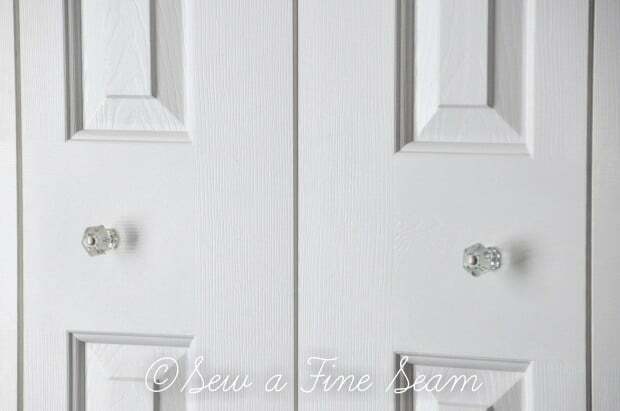 When we renovated the girls bedrooms we added closets to both of them. I bought the basket at Home Goods to keep my youngest daughters stuffed animals in. Believe it or not there are too many to fit in this basket. Someday I will share with you just how many stuffed animals my girls own! The large penguin in the back fits nicely in that sharp, tight corner. The picture of the sailboat is one I found while thrifting last year. I painted the frame and was planning to resell it but my Middle Girl loved it so much I saved it and gave it to her for Christmas. Without even trying we somehow have a bit of a nautical theme going on. The sailboat pic, this anchor that Larke, my Middle Girl, begged me to buy for her at a garage sale, and Becca’s shells. The anchor I painted with a couple of the paints I used on the wall. The other side of the room now holds the locker along with the storage system we bought at IKEA a couple years ago. And a little desk we bought at a school auction. The artwork above the desk is from IKEA. We have a bulletin board that is supposed to hang there eventually but we want to cover it with fabric first. And I just didn’t get that project done so we tacked this fun artwork up for now. Dotted duvet cover is from IKEA. Lace pillow cover was designed and created by my Teenager, Emma. 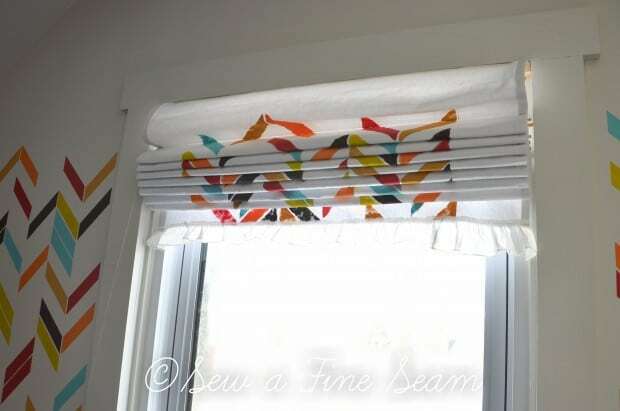 The Roman shade is made of pure white duck cloth. I will have another post coming with a few details about how I made it and how this fabric does compared to other fabrics. I did go back to my own tutorial and used it to make this new shade! If you like the look stencils can bring to a room or project go check out all the great options at Royal Design Studio Stencils. I love their quality and the list of things you could do is just endless! 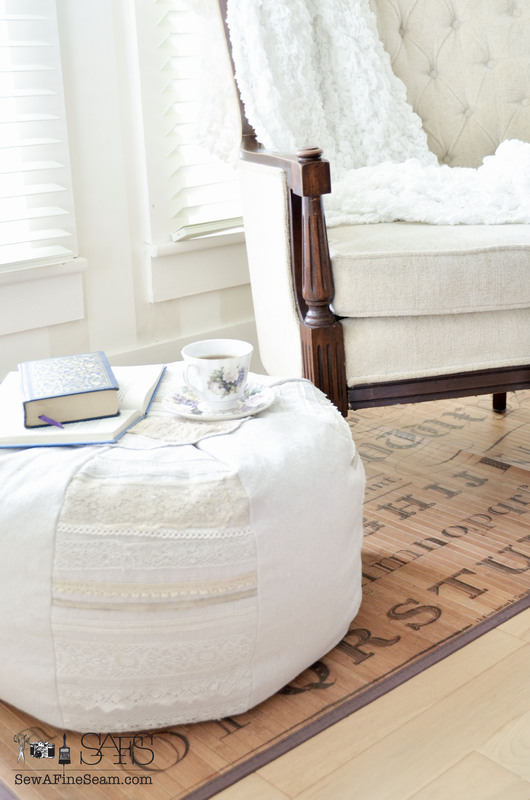 Have you used stencils in projects? Do you have a project you would like to use a stencil on? Thanks Meg! I love it too and my girls love it – even the little girly touches I added! Which makes it a win-win! That stencil just makes her room, Jill! 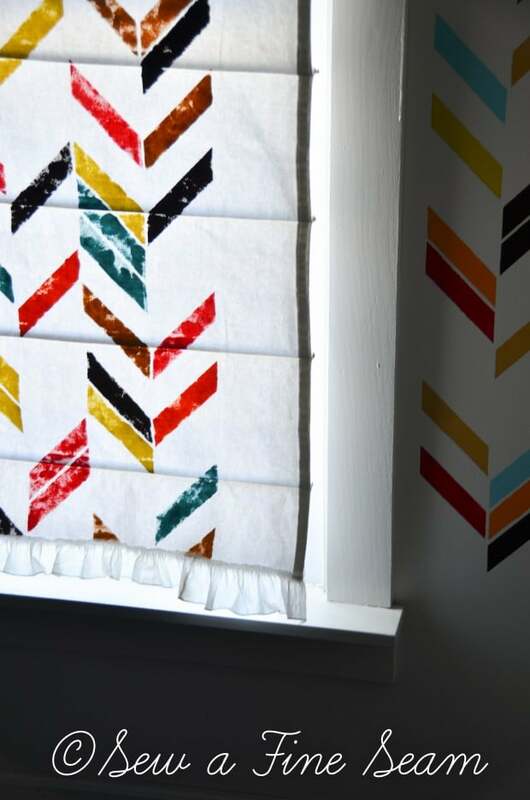 Your color combination is perfect and roman shade idea is so clever! What a fun space for her!! Thanks so much Pam! I love how this turned out and it’s so fun to finally share it! Can you believe all the COLOR I used in this space?! LOL! I could not love that stencil any more! 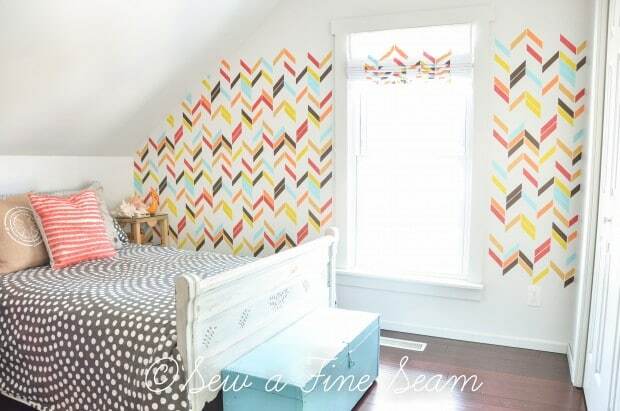 The room is perfect for a growing girl, and I’m sure she loves it! Isn’t it fun Jennifer? 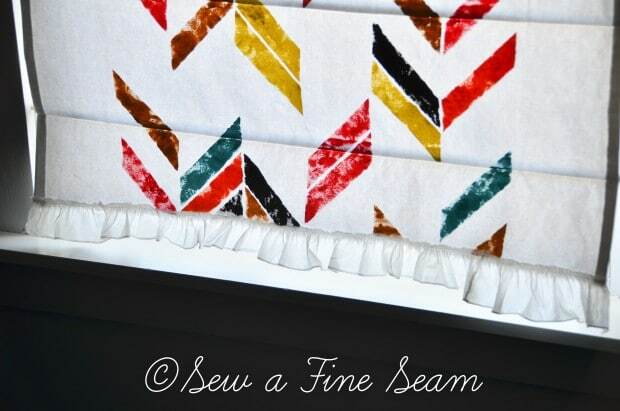 I love how it did on the fabric too – thinking I need to use part of it to make some handbags maybe?? Drop cloth canvas painted with the stencil and then turned into a bag! What a fun room Jill!! 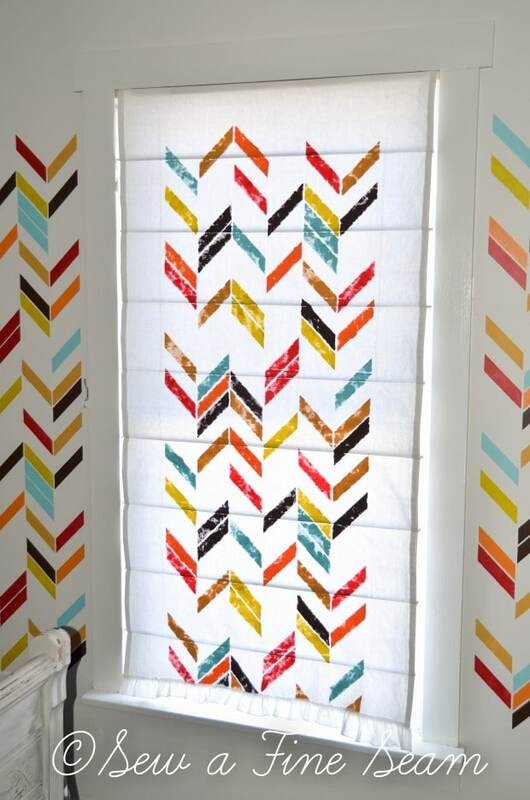 I love the mix of patterns and colors and all your fun personal touches. GREAT job with the stenciling. 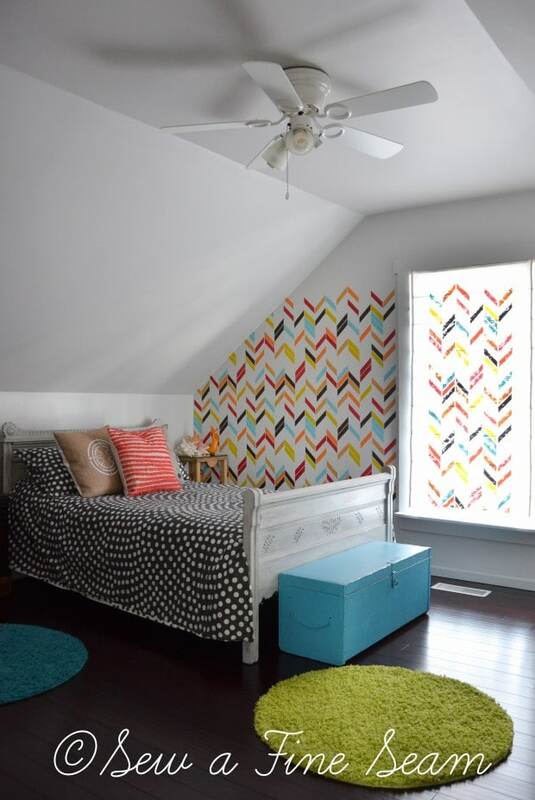 The Herringbone Shuffle stencil is one of our most popular patterns and you ROCKED it!! Thanks Melanie! I love how it transformed this room for my girls. I have some ideas for using the stencil for some handmade tote bags too! 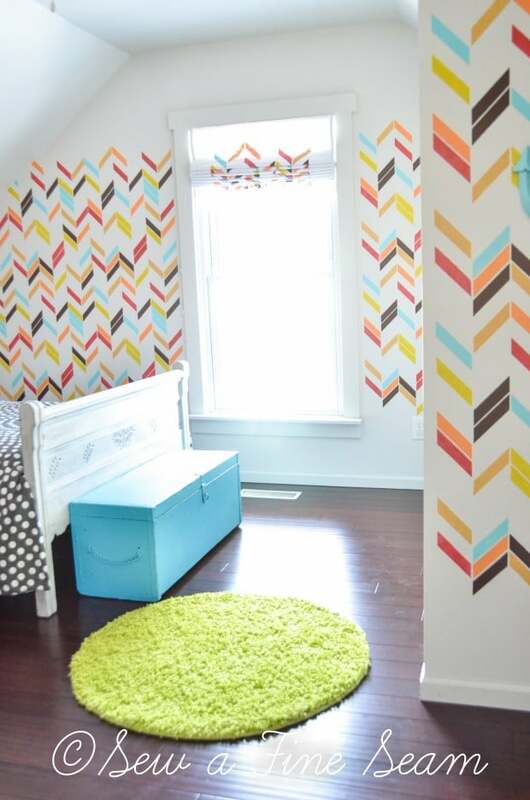 Cute room, Jill and love all those bright colors. Thanks Kim! My girls are loving it and I’m very happy with how it turned out! 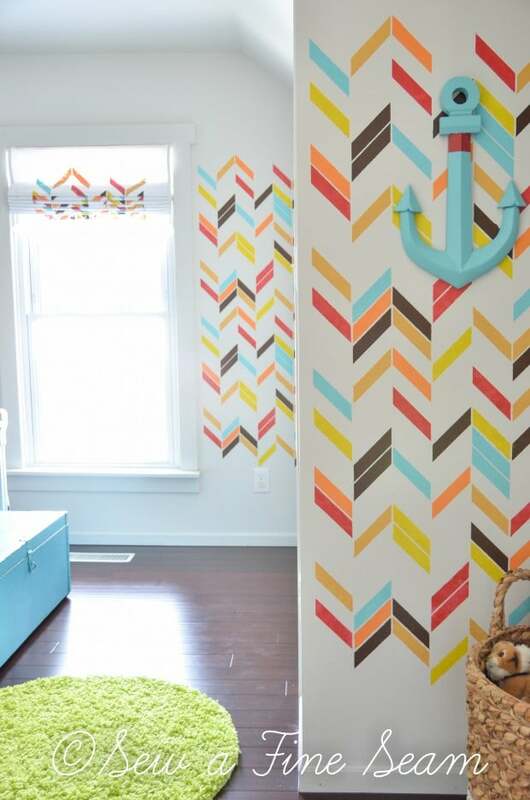 Love, love, love all the COLOR in this room! I love that it’s just splashes of color with a nice white background still. Yes, the color lovers can go sit in my girls room when the white of the rest of my house gets to them – LOL! I love it too – it’s just perfect for my girls! Something tells me that the girls were totally thrilled! 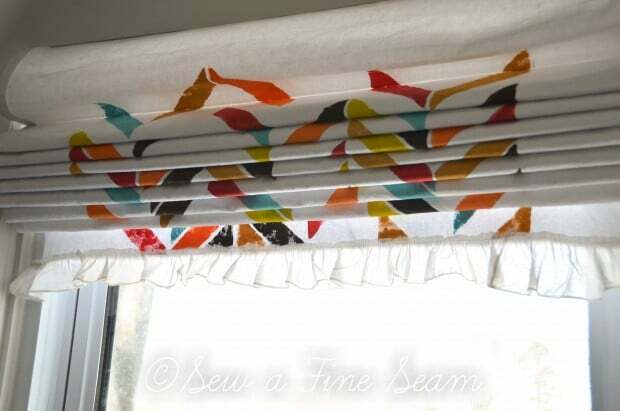 They were Kendra – they even loved the little ruffle I added to the roman shade! 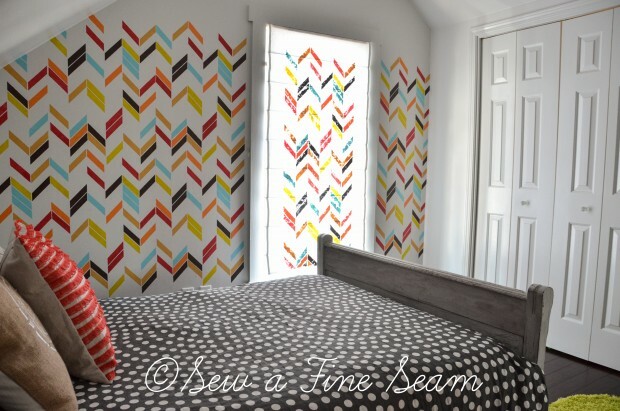 You did such a nice job with your girls bedroom! 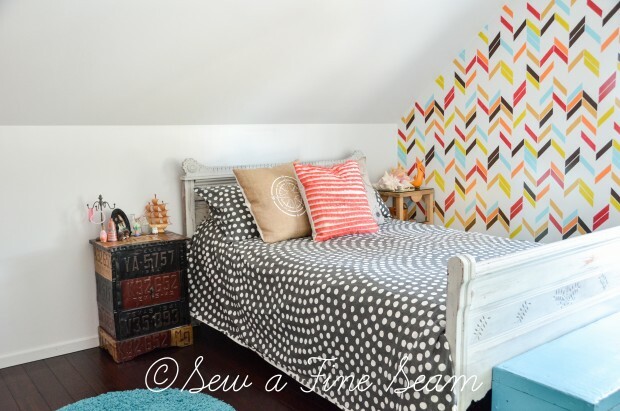 I love how you made that back wall a focal point with colorful geometric shapes. 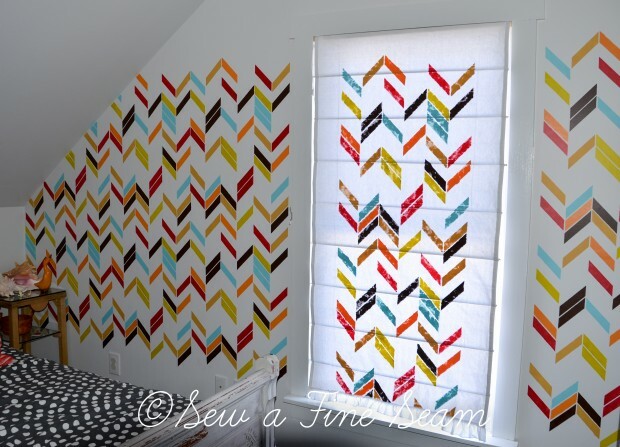 I have stenciled walls before, but not in my current house. I also like the spot rugs you used. They are so fun! Beautiful!!!!!! You are so creative and talented!!!!! Wow. What a room. It’s so bright, colorful and cheery. It’s also so clean. I am impressed and inspired…as always. Thanks Amy! come back next week – I’ll be showing inside the closet and a couple other spots where I stashed everything! And within minutes of me saying I was done with the photo shoot the room wasn’t photo worthy anymore! Wonderful issues altogether, you just gained a logo new reader. What could you recommend in regards to your post that you simply made some days ago? Any sure? Love all the colors you used for the stencil!!! Thanks Jen! Happy you came by my blog and left a comment! The room looks so lovely! The hardwoods make it so clean and spacious and the paint treatment and matching blind add color and life. And I do adore that little ruffle-a mama has to sneak in her own touch sometimes! 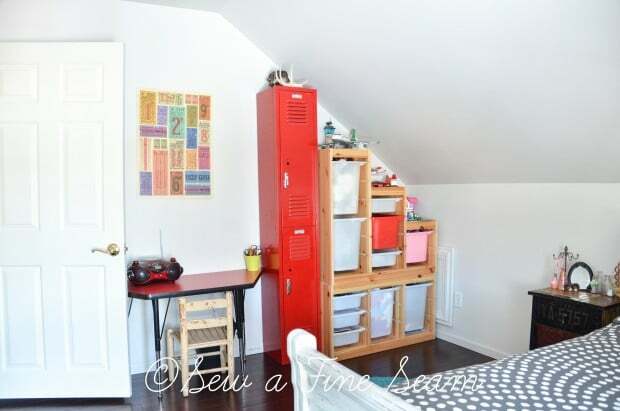 The locker and storage unit look like they were tailor made for that sloping ceiling too. Thanks for sharing at Fridays Unfolded! What an amazing room! I love all the color and the fun eclectic look it has. Such a creative space! Thank you so much Abby – I had fun creating this space for my girls and they love it which makes it even better 😀 Glad you came by! Jill! This is absolutely stunning! 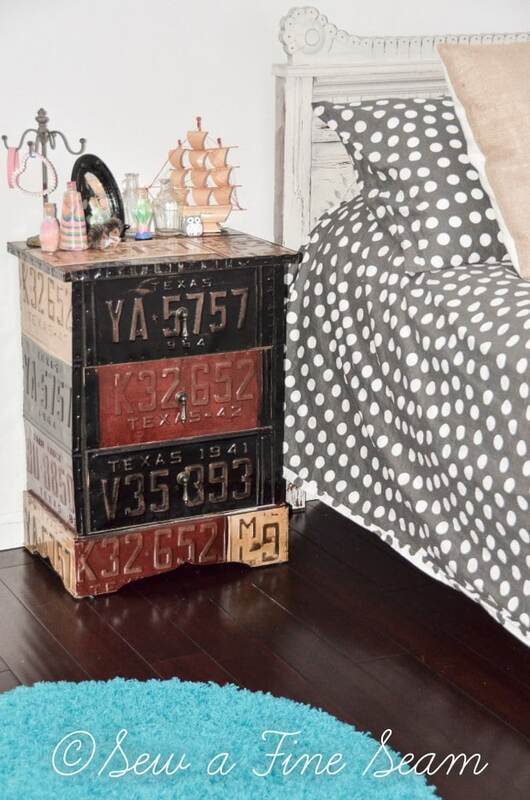 What a fun, eclectic bedroom. I love the pops of color with the gray bedspread. You did such a good job. 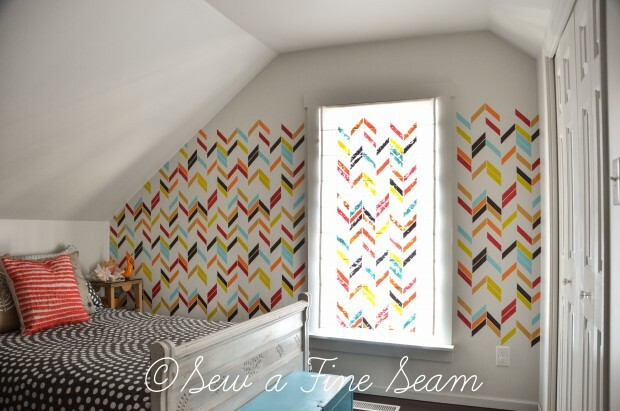 I looove the herringbone, what fun colors in here! Beautiful makeover. Great use of graphics. Jill I will feature this, this week at Home Sweet Home! Great space! Oh. My. Goodness. I love this room! I think that nightstand is perfect; I am a major Hobby Lobby shopper too! Your blog is so beautiful; I found you through Nancherrow, and I am definitely your newest follower! 🙂 Pinning this room as well. 😉 Thanks so much! Awww, thanks so much Leslie! So happy to have you come by! 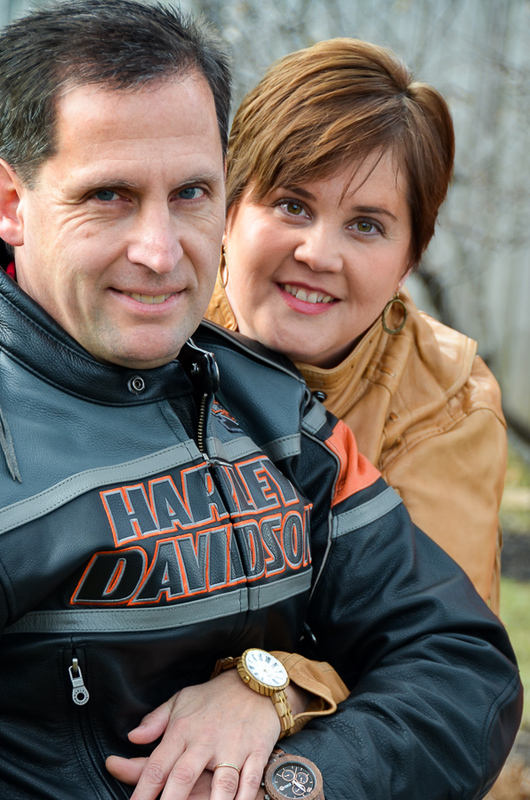 Loved this post, Jill! It’s giving me courage to try to stencil a new shade for our office remodel. 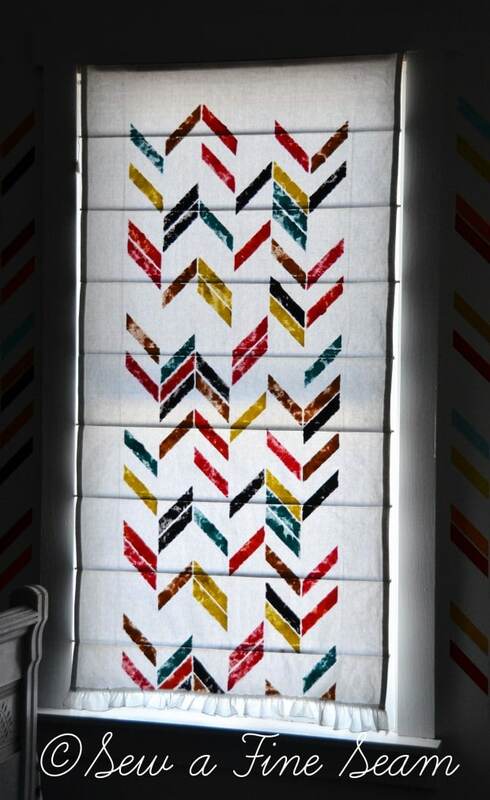 I was in LOVE with a custom roman shade on Etsy that used Orla Kiely “Stem” print but it was oodles of money and just not doable. Stenciling something similar in color and vibrancy seems much more doable now that I’ve seen your BEAUTIFUL shade. Any tips or tricks you learned along the way? It’s really not hard at all to stencil on fabric – the less paint you saturate your brush with the better it will end up – more crisp lines. 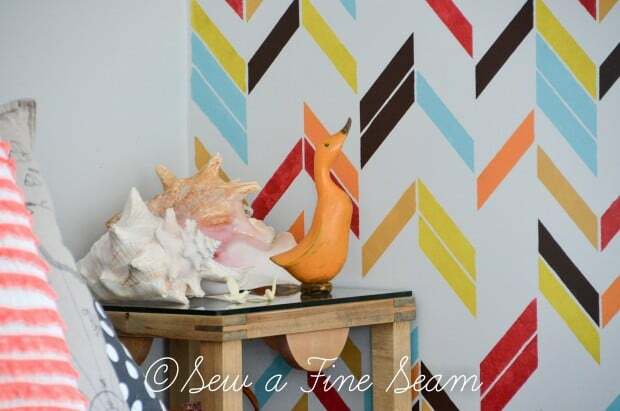 You can go very light with the paint and make it look almost like a water color print instead of stenciled. Just start with a little and add paint till you love it!